Nelkin Designs Blog: Obsession Cowl: My Craftsy Mystery Knit-A-Long! Well, just about a month ago I announced my next project, a Mystery KAL with Craftsy! Guess what? It's a month later, and time for the BIG REVEAL! 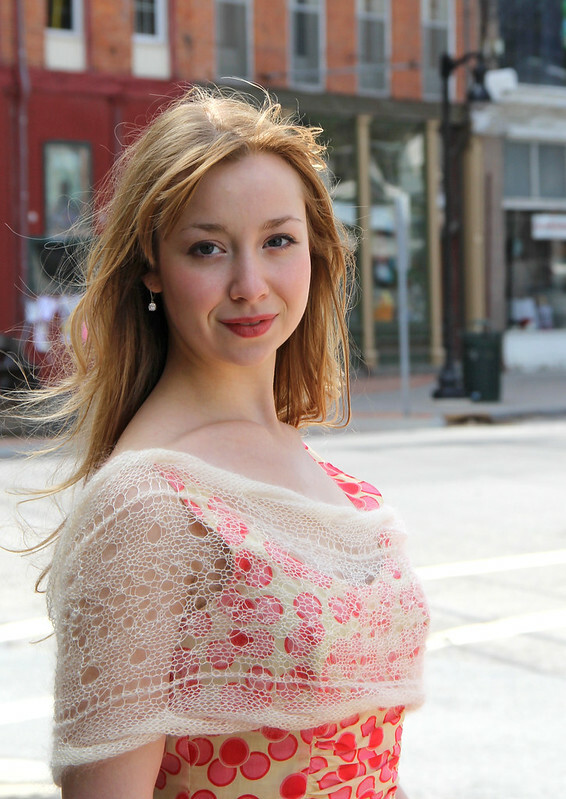 Obsessio is an ethereal lacy summer cowl meant to be worn draped over the shoulders or wrapped around the neck. This undyed silk/mohair lace yarn by ArtYarns is worked at a very loose gauge on large needles, which makes it akin to wrestling with butterfly wings. It's the perfect summer knit! Obessio starts with a provisional cast-on, and is worked in one long rectangle. The two ends of the rectangle are then grafted together to create the cowl shaping. The stitch pattern combines a modified feather and fan with double yarnovers, and fat cables on each outer edge. The long fibers in this silk mohair yarn bloom magnificently, and working it at this large gauge allows the fiber to expand. For this reason, the stitch pattern is not overly complex, as it would be lost in the halo. It's such fun to design simple projects that still challenge the knitter and delight the recipient, even if it's for you! I can't wait to hear what you think! For those of you participating I'll see you over in the Craftsy workshop! For those of you who have decided to wait until I release the pattern in August... start thinking about yarn! And maybe beads??????? This is stunning! I can't wait to make it! I bought the KAL and now I am being charged another 12$ for the pattern?!?!? If I did not have other purchases on Craftsy I would delete my account now. If you bought the KAL you definitely don't need to buy the pattern! Sign into Craftsy, you should see the workshop listed in your purchased classes, if not, drop Craftsy a note, they might have had a glitch getting you all registered at once? If you still have trouble let me know, I'll check in with them on my end too! I'm having the same problem. I've paid for this KAL and have gotten my yarn & my email to access the pattern and it is not in my account and saying I need to pay for it!!! This is frustrating!!! I also bought the mystery knit...for $25 bucks and now i have to buy the pattern? What is with that? It did not say that the pattern was separate otherwise i would not have bought it...is there any way of getting a refund? Craftsy clearly has it all screwed up, it's trying to charge me again for the pattern too. What a disappointment. This is my first mystery KAL that I have purchased from Craftsy & I definitely won't be doing it again. Don't worry Kay, Craftsy is "on" it! They know there is a glitch and are fixing it now, no need for you to buy the pattern, you will be given access as soon as they fix what went wrong with the system, don't loose hope yet! Well, we gots to get it to you then!!!! Thanks for loving on it! Still waiting for them to fix the glitch in the system so I can get started! Where do I find a size 10.5 cable needle? You can use a bamboo or wood dpn, that's what i did! Thank you. When will crafts give us access to the pattern I don't want to purchase it again? Hopefully soon... it's a Saturday and they are in Colorado, they are working on it! Thank you! Look forward to getting started, will be patient. I seem to be having the same problem as some other folks regarding being asked to pay for the patter after paying for the complete KAL. I got the email for the start of it but when I click on it I come out on the purchase page for $12.00 more for the pattern etc. Will have to contact Craftsy so find out what's up with this? Hi! I am so sorry... I promise that it is being worked on! Feel free to contact Craftsy at help@craftsy.com to let them know you haven't been activated... Hopefully you have something else on the needles while you wait? Thanks for being on top of this Laura! I'm sure Craftsy will get it fixed. I panicked along with everyone else, but I'm glad I found this blog. Maybe Craftsy could send a message to say that they're working on it (?) Can't wait to get started though! Aw, thanks for your understanding!!!!! Me, too. After all the excitement of June 1 finally arriving (just like Christmas when I was kid!) ... I assumed the $11.99 was the new sign-up price for the workshop, including yarn and instructions. Hope we're all wrong no matter how we interpreted it! I do understand glitches, though ... and when we finally get the instructions, how sweet it will be! What a gorgeous pattern, Laura—it will look gorgeous on everyone. Brilliant! I guess I have had the same problem as everyone else. This is my first KAL and I did pay extra for the pattern as I just didn't know. Thought it was odd and thought it was very nice of them to add that to the price but now I see why. I am hoping they give me credit for the pattern. The yarn is lovely and since I did buy it I am working on the gauge. I also am taking your Mastering Lace Shawls course--learning a lot! Craftsy emailed me already to credit the charge for the pattern. So they fixed the problem quickly which is very nice. Oh wonderful! That's great to hear that they took care of it so quickly! Go Craftsy! It's beautiful!! what a gorgeous design.